This was on hold at the moment due to works in the High Street. It is hoped that the High Street will be open to market traders in August 2014. The Prayer stall will be there primarily to “Say one for me”, it will not be there specifically to sell items. HR did say that she hoped to have a banner made and for those on duty to wear fleeces with “Prayer Pastor” written on it. The cost of hiring the stall is £30.00 per time and there was some concern how this was going to be met in the long term. There is a 37% reduction in ASBOs on Friday nights – apparently Saturday nights are very different. £8.00 a night is spent on consumables. In the last year 2177 conversations were had and first aid administered to 30 people. Volunteers have to train for 20 hours, so some do not complete the course. It has been suggested that if each SP could recruit another one, the numbers of Street Pastors would double, so that Saturday nights could be covered as well. It is hoped that Street Pastors could expand to Catshill to go in to schools, be there when children are taken to and from school and out on the street from 8pm – 9.30pm when youngsters are out with their bikes. 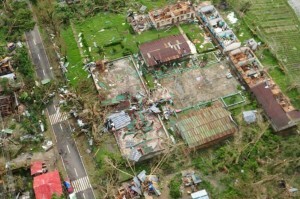 JP said that there are funds available if we can provide people. There is an ‘app’ called ‘Your night’ that can be downloaded which will give guidance of where assistance can be received. 25 Christians from different Churches enjoy telling stories from the Bible to children in first schools. The first school in Catshill is looking forward to beginning ‘Open the Book’ in September 2014. The Meadows and Millfields schools have been enjoying the same for a couple of years now and the children even greet those who take part when out shopping with their parents. Journey, scorching sun, tiredness, thirst … “Give me to drink.” This is a demand of all human beings. God, who becomes human in Christ (Jn 1:14) and empties himself to share our humanity (Philippians 2:6-7) is capable of asking the Samaritan woman: “Give me to drink” (Jn 4:7). At the same time, this God who comes to encounter us, offers the living water: “The water that I will give will become in them a spring of water welling up to eternal life” (Jn 4:14). The encounter between Jesus and the Samaritan woman invites us to try water from a different well and also to offer a little of our own. In diversity, we enrich each other. The Week of Prayer for Christian Unity is a privileged moment for prayer, encounter and dialogue. It is an opportunity to recognize the richness and value that are present in the other, the different, and to ask God for the gift of unity. “Whoever drinks of this water keeps coming back,” says a Brazilian proverb, always used when a visitor leaves. A refreshing glass of water, chimarrão1, coffee, tereré2, are trademarks of acceptance, dialogue and coexistence. The biblical gesture of offering water to whomever arrives (Mt 10:42), as a way of welcoming and sharing, is something that is repeated in all regions of Brazil. The proposed study and meditation on this text during the Week of Prayer is to help people and communities to realize the dialogical dimension of the project of Jesus, which we call the Kingdom of God. This years Pentecost in the park hosted on June the 8th and well attended by all supporters from all of the Churches in Bromsgrove. The Worship Group from New Song Church led the attendees with some traditional and Contemporary songs before the word was brought by Minister John Notman. Thanks ASDA– and your shoppers! Once again ASDA have come up trumps allowing us to collect food outside their store in the town. And once again the ASDA shoppers have responded to our pleas for tins and packets marvellously. We ended up with 30 crates jam packed with food that will be used to help create Christmas Hampers for young homeless people in our area. 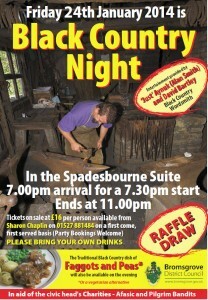 Mr Andrew Jones invite you to join them at a Black Country Night. This year’s theme comes to us from the Churches of French Canada. Canadians live in a country that is marked by diversity in language, culture, and even climate, and it also embodies diversity in expressions of Christian faith. 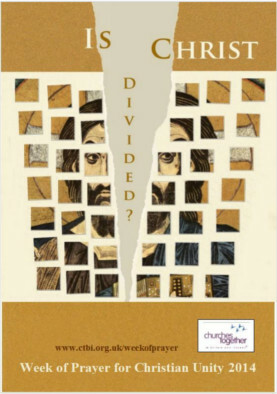 Living with this diversity, but being faithful to Christ’s desire for the unity of his disciples, has led them to a reflection on Paul’s provocative question in 1 Corinthians, “Has Christ been divided?” In faith we respond, “No!” yet our church communities continue to endure scandalous divisions. 1 Corinthians also points us to a way in which we can value and receive the gifts of others even now in the midst of our divisions, and that is an encouragement to us in our work for unity. The Churches of Canada have a strong history of co-operation and mutual support. Their history includes examples of common efforts, shared ministries, and even the union of several churches. Where organic unity of churches has not been possible, they have often achieved common agreements and shared ministries that witness to growing unity in Christ. The churches have acted together on issues related to poverty and social justice, and together many of the churches are beginning to take responsibility for what they see as their un-Christ-like attitudes towards indigenous peoples in their country. And yet, despite these encouraging movements towards the unity that Christ desires, disunity prevails. A consequence of this disunity is revealed in behaviour towards neighbours and the planet. In considering the many blessings and gifts of God made manifest in their country and peoples, the Canadian Churches have begun to recognize that they must treat one another, and the very land from which they derive their living, with dignity and respect. We can share this recognition and how it calls us all to confession and repentance, and to the seeking of new and sustainable ways of living on the earth. It raises our consciousness about how God has blessed us all, and that no one group can decide how to use the world’s resources without hearing and including the voices of our fellow human beings. The Chair welcomed everyone and stated the format for the Evening. She spoke about Halleluiah and its meaning, read Psalm 136 and sang the Gloria with everyone taking part. This is a frontier Church formed in the 1960s. They embrace all and have many young families and teenagers, the latter who actually take notes during 45 minute sermons! They do not have a liturgy as such but preach the Word of God from the Scriptures. Their vision is to bring others to know the love of God, saying everyone is important and a part of the ‘Church’. Their mission is that everyone is consumed by God and to glorify Him as such. Their Church is growing but has no permanent base and meets in St John’s School at 4.00pm on Sundays. They also have an Alpha course running on Tuesday evenings at The Swan at Wychbold. 3. CTiB website launch carried out by the Chair. Yvonne took the meeting through the functionality of the website with a selection of screenshots. Everyone was most impressed by the structure and that all the Churches were linked in and by placing the cursor on one Church, this would link in to the activities of that Church and its Services. All the CTIB backed events that are happening in Bromsgrove are on the site, so we should all be better informed providing we have access to a computer! Bromsgrove Anglican Group are sending off a cheque for £300.00 for the Philippines Typhoon Victims (Disasters Emergency Committee) on behalf of all the Churches in Bromsgrove. This money was raised earlier in the year at a Folk Evening and kept by the Bromsgrove Anglican Group to help in any world emergency. This has always been the policy from monies raised that it helps where desperately needed both locally and throughout the world in emergencies. To support please visit the Christian Aid Website. Picture supplied from Christian Aid Presentation. 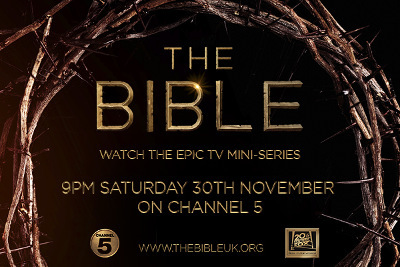 The first episode of the epic TV mini-series THE BIBLE will be broadcast at 9pm on Saturday 30th November on Channel 5. Find out more at www.thebibleuk.org/tx. This will be a 10 part series of about 2 hours each. There may also be the need for the successful candidate to take clients to appointments when necessary and appropriate – for which normal expenses will be paid. Therefore access to a vehicle would be highly desirable but not essential. The ideal candidate will be flexible in their attitude to what they are requested to do and will also be sympathetic to the aims and objectives of the project. The actual hours of work can be agreed with the Operations Manager by the successful applicant, but preferably the assistant will be in situ for at least 4 days a week. Wages will be based around the current living wage (£7.65 outside of London), depending upon experience. Closing Date for applications is Friday November 29th at 5 pm and applicants should initially contact the undersigned by email to advise of their interest in the role. Interviews will then be arranged as appropriate. Potential applicants can also contact the undersigned by email if they have questions about the role.